I love seafood...being from Maryland we put crab and shrimp and lobster in everything! 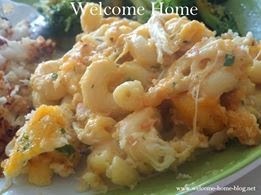 I also love mac and cheese so you can imagine how much I love this recipe! 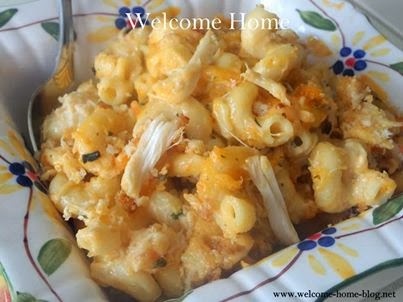 I make it often and it is always a big hit...let me know how you like it! Preheat oven to 375 degrees. Boil pasta in salted water until tender, drain well in colander, then return to pot and set aside. Melt butter over medium heat in a large saucepan. Add flour and whisk until smooth. Continue stirring butter and flour mixture over medium heat for 2 minutes until it lightly browned. Slowly pour in milk or half and half while whisking and whisk until smooth. Cook while stirring constantly for 2-3 minutes until mixture thickens. Add salt, pepper, and a pinch of Old Bay seasoning. Add cream cheese and whisk until smooth. Remove from heat and add the grated cheddar and Monterey jack cheese. Stir with a wooden spoon until smooth. Stir in pasta and gently fold in crab meat. Spray a 9 x 13 casserole dish with non stick spray. Pour in filling and spread out evenly. Mix panko with oil and butter and sprinkle all over top to completely cover. Bake for 15-20 minutes until golden brown and bubbling around the edge. This sounds soooo good I wish I had some to eat right now!!!! This looks and sounds so good, I wish I had some to eat right now.